I have been listening to a lot of audibles recently, audible first has certainly made me use existing credits that I leave patiently waiting for the right book to come along. Dane’s Storm was a no brainer for me and anyone that knows me knows that Mia Sheridan has penned my all-time favourite read, Archer’s Voice and now I cannot wait to actually read this one in print. Now, what I am going to say is something I never, ever thought I would say, Dane’s Storm is Archer’s equal. Two very different stories yet both have left a lasting effect. This is a story I will definitely read time and time again, a book that will go on my all-time favourites list and a first in my audible listening experience…it made me cry and not just a few tears either, guttural sobbing in parts. 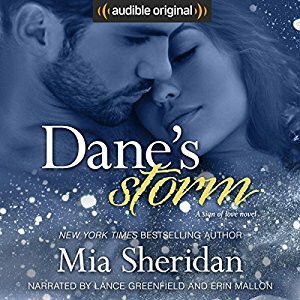 Mia Sheridan never fails to deliver with her words, words that on their own mean one little thing, yet when she effortlessly weaves them together, they pack one hell of an emotional punch and she definitely doesn’t hold back with Dane’s Storm. This is second chance romance at it’s finest with a lot of emotion, drama I never saw coming and a lesson that you don’t choose love, love chooses you. Social class is the biggest hurdle that these two childhood sweethearts have to overcome, they married young and divorced soon after, after a tragedy robbed them of happiness. Dane loved Audra with everything he had and vice versa, but sometimes love isn’t enough when you have a meddling family that don’t believe in marrying beneath them. When Dane and Audra’s paths cross years later, no-one could have anticipated what these two would have to go through to get their happy ever after. These two had never moved on from the other emotionally, although Dane did try, both their hearts yearning for that first love, love that was never forgotten and remembered frequently. Audra’s life has literally been frozen in time for the seven years they have been apart with Dane being her first and only. When Audra’s business comes under threat from Dane’s tyrannical grandmother, Audra has no option than to seek Dane’s help in the vague hope that he can put a stop to the woman that had never accepted her and was determined to destroy her. I have to say; the narrators did a fantastic job in bringing these characters to life. At first it took a while to gel with Dane’s voice but once I got used to his often-breathy dialogue it didn’t needle me as much as it did to begin with. Audra’s narrator was succinct, with great expression and emotion and I felt that this narrator really delved into Audra’s character and made this her own. I went into this one totally blind as I always do with a Mia Sheridan book so I was not expecting the plane crash at all, which, had I read the synopsis I would have known about. When these two find themselves helpless on a snowy mountain top, Mia Sheridan really ramps up the drama as this second chance romance takes on a Survivor twist and makes these two realise that they truly cannot live without one and other, but with their precarious situation, that choice may be taken away from them. This was emotion overload, my tear ducts were working overtime with this one and as I said above, I have never cried with audio before. This one pulled those emotional punches one after the other as your heart hopes that now they have reconnected, it isn’t taken away. With an epilogue to die for, Mia Sheridan wraps up this second chance with a lot of love and a story that I will treasure for a long, long time.